I recently finished reading these two books to begin 2019 hoping that what I do in the first few days of the New Year will set a precedent throughout the year. I chose these two books because my friend Gayatri Neupane passionately recommended the Madan prize awarded book “Antarman ko Yatra,” meaning Journey to Inner Conscience, by Jagdish Ghimire and because Manisha Koirala’s “Healed” was recently released at the International Nepali literature festival in Pokhara. Out of my respect for both writers Jagdish and Manisha, I purchased those books. Both of them shared the same destiny, meaning they experienced cancer, one with multiple Myeloma and the other with ovarian cancer, underwent chemo, lived a few times between life and death, one lost the game and the other won it but both of them learned lessons through reflections. They have similar stories to share in terms of what one gains and losses when one battles cancer, how cancer one suffers from is not a bane but a boon that awakens the reality of life, unfolds the petals of painful memories, confesses blunders and learns or teaches us to live a promising life carefully, cautiously, and respectfully, makes apologies for the mistakes that have been made, survives apprehensions, and walks with confidence with a warm smile on the face. It is an epiphany, an enlightenment, a revelation. In that sense, both books are terrific that enlightens how self and health are important and how your healthy presence communicates to society and the world at large. I have high respect for both writes who have shared great quotes from great people, discussed healthy diets, and the facts of honesty, integrity, and spirituality. At last, beautiful and lucidly written with extremely poetic images, Manisha’s book is more focused but has less content. 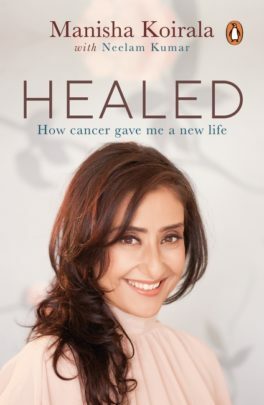 I would love to read her reflections more on her Bollywood experience and her relationships, perhaps I would not want to read some of her discussion and explanation about the festivals in the book that averted my attention although that might be important for her English audience. Jagadish’s book has more than enough repetitions and lacks coherence at times but has terrific ideas to change one’s life.